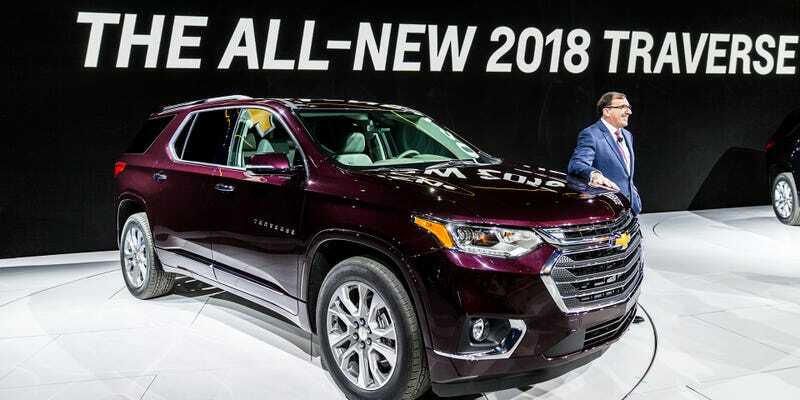 The 2018 Chevrolet Traverse just showed its face at the Detroit Auto Show, and aside from a new 2.0-liter turbo inline-four and nine-speed automatic, it’s exactly what you thought it would be. America’s most bloated Minivan With Doors is all-new for 2018, and, well, it’s a car. That you can buy starting this fall. Introduced by President of General Motors North America Alan Batey as a vehicle that was “designed and engineered to fit the active lives of [GM’s] customers,” the predictable new Traverse comes with exciting features like 24 cubbies, flat-folding rear benches, and a 10-inch deep storage area behind the rear bench. Plus, like almost all modern automakers, Chevy added a bunch of active safety features like Forward Collision Warning and Lane Keep Assist. On top of that, the new chubby crossover gets Android Auto, Apple CarPlay, Traction Mode Select (selectable drive modes), and one of those hands-free liftgates that you can wave your foot under. The styling, too, is also not the least bit surprising, looking just like a slightly chunkier Equinox. Admittedly the Traverse isn’t meant to be particularly exciting, as its customers probably value things like interior volume and fuel economy over things like aggressive sheetmetal or sporty handling. And the new Traverse apparently delivers in those more “sensible” areas, as Chevy says the crossover offers maximum cargo and passenger volume for the segment, seating for up to eight adults, and 25 MPG highway/18 City with the standard 305-horsepower 3.5-liter V6. Plus, it can tow 5,000 pounds. There are also two new trim levels, the RS and the High Country. The former is the trim that gets the 2.0-liter turbo inline-four, which makes 255 horsepower and 295 lb-ft of torque. That’s 35 lb-ft more than the V6, but a full 50 horsepower less. Strangely, the smaller, less powerful motor manages worse highway fuel economy at only 23 MPG, but better city mileage at 20 MPG. The second new trim level, the fancy High Country, gets a “twin-clutch” all-wheel drive system, power third row seats and leather interior bits. So basically, Chevy took what they did to the Equinox, and applied it to the Traverse. Nothing outlandish, but probably a fine car for hauling large humans.